The Border Collie is a herding dog breed developed in the Anglo-Scottish border region for herding livestock, especially sheep. It is the most widespread of the collie breeds. Typically extremely energetic, acrobatic, and athletic, they frequently compete with great success in dog sports, in addition to their success in sheepdog trials, and are often cited as the most intelligent of all dogs. Border Collies are noted for their intelligence. In January 2011, a Border Collie was reported to have learned 1,022 words, and acts consequently to human citation of those words. The Border Collie is descended from landrace collies, of a type found widely in the British Isles. The name for the breed came from its probable place of origin along the Scottish English borders. Mention of the "Collie" or "Colley" type first appeared toward the end of the 19th century, although the word "collie" is older than this and has its origin in Lowland Scots dialects. Many of the best Border Collies today can be traced back to a dog known as Old Hemp. In 1915, James Reid, Secretary of the International Sheep Dog Society in the United Kingdom first used the term "Border Collie" to distinguish those dogs registered by the ISDS from the Kennel Club's Collie (or Scotch Collie, including the Rough Collie and Smooth Collie) which originally came from the same working stock but had developed a different, standardised appearance following introduction to the show ring in 1860 and mixture with other breeds. Wiston Cap (b. 28 Sep. 1963) is the dog that the International Sheep Dog Society (ISDS) badge portrays in the characteristic Border Collie herding pose. He was a popular stud dog in the history of the breed, and his bloodline can be seen in most bloodlines of the modern day Collie. Bred by W. S. Hetherington and trained and handled by John Richardson, Cap was a biddable and good-natured dog. His bloodlines all trace back to the early registered dogs of the stud book, and to J. M. Wilson's Cap, whose name occurs sixteen times within seven generations in his pedigree. Wiston Cap sired three Supreme Champions and is grand-sire of three others, one of whom was E. W. Edwards' Bill, who won the championship twice. In the late 1890s James Lilico (1861?–1945) of Christchurch, New Zealand, imported a number of working dogs from the United Kingdom. These included Hindhope Jed, a black, tan and white born in Hindhope, Scotland in 1895, as well as Maudie, Moss of Ancrum, Ness and Old Bob. At the time of her departure to New Zealand, Hindhope Jed was already in pup to Captain, another of the then new "Border" strain. Hindhope Jed had won three trials in her native Scotland, and was considered to be the "best to cross the equator". In general, Border Collies are medium-sized dogs without extreme physical characteristics and with a moderate amount of coat, which means not much hair will be shed. Their double coats vary from slick to lush, and come in many colours, although black and white is the most common. Black tricolour (black/tan/white or sable and white), red (chocolate) and white, and red tricolour (red/tan/white) also occur regularly, with other colours such as blue, lilac, red merle, blue merle, brindle and "Australian red"/gold seen less frequently. Border Collies may also have single-colour coats. Eye colour varies from deep brown to amber or blue, and occasionally eyes of differing colour occur. (This is usually seen with "merles"). The ears of the Border Collie are also variable — some have fully erect ears, some fully dropped ears, and others semi-erect ears (similar to those of the rough Collie or sighthounds). Although working Border Collie handlers sometimes have superstitions about the appearance of their dogs (handlers may avoid mostly white dogs due to the unfounded idea that sheep will not respect a white or almost all white dog), in general a dog's appearance is considered by the American Border Collie Association to be irrelevant. It is considered much more useful to identify a working Border Collie by its attitude and ability than by its looks. Height at withers: Males from 19 to 22 in (48 to 56 cm), females from 18 to 21 in (46 to 53 cm). Border Collies require considerable daily physical exercise and mental stimulation. Border Collies are an intelligent breed. It is widely considered to be one of the most intelligent dog breeds. Although the primary role of the Border Collie is that of the working stock dog, dogs of this breed are becoming increasingly popular as pets. True to their working heritage, Border Collies make very demanding, energetic pets that are better off in households that can provide them with plenty of play and exercise with humans or other dogs. Due to their demanding personalities and need for mental stimulation and exercise, many border collies develop neurotic behaviors in households that are not able to provide for their needs. They are famous for chewing holes in walls and digging holes out of boredom. As a result, an alarming number of border collies end up in shelters and rescues every year. One of the prime reasons for getting rid of a border collie is their unsuitability for families with small children, cats, and other dogs, due to their intense desire to herd, bred into them for hundreds of years and still one of their chief uses outside the household. Though they are common choice for household pets, Border Collies have attributes that make them less suited for those who cannot give them the exercise they need. As with many working breeds, Border Collies can be motion-sensitive and they may chase moving vehicles. The natural life span of the Border Collie is between 10 and 17 years, with an average lifespan of twelve years. The median longevities of breeds of similar size are usually 12 to 13 years. Leading causes of death were cancer (23.6 %), old age (17.9 %) and cerebral vascular afflictions (9.4 %). Hip dysplasia, Collie eye anomaly (CEA), and epilepsy are considered the primary genetic diseases of concern in the breed at this time. CEA is a congenital, inherited eye disease involving the retina, choroid, and sclera that sometimes affects Border Collies. In Border Collies, it is generally a mild disease and rarely significantly impairs vision. There is now a DNA test available for CEA and, through its use, breeders can ensure that they will not produce affected pups. There are different types of hip testing available including OFA (Orthopedic Foundation for Animals) and PennHip. Radiographs are taken and sent to these organisations to determine a dog's hip and elbow quality. Trapped Neutrophil Syndrome (TNS) is a hereditary disease in which the bone marrow produces neutrophils (white cells) but is unable to effectively release them into the bloodstream. Affected puppies have an impaired immune system and will eventually die from infections they cannot fight. The mutation responsible for TNS has been found in Border Collies in English working dogs, in show dogs that had originated in Australia and New Zealand, and in unrelated Australian working dogs. This indicates that the gene is widespread and probably as old as the breed itself. TNS was identified by Jeremy Shearman in the laboratory of Dr. Alan Wilton of the School of Biotechnology and Biomolecular Sciences, University of New South Wales. There is no cure, but a DNA test is now available to detect carriers as well as affected dogs. Elbow dysplasia or osteochondritis, deafness, and hypothyroidism may also occur in the breed. Dogs homozygous for the merle gene are likely to have eye and/or hearing problems. As is the case with many breeds of dogs that are still used for their original purposes, breed standards vary depending on whether the registry is more interested in a dog that performs its job superbly or a dog whose appearance meets an ideal standard. There are two types of tests, or standards, to determine the breeding quality of a Border Collie. The original test was the ISDS sheepdog trial, still used today, where a dog and handler collect groups of livestock and move them quietly around a course. There are certain standard elements to this test. Sheep must be gathered without being too much disturbed, from a distance farther than the typical small airport runway. They then must be directed through obstacles at varying distance from the handler, and then the dog must demonstrate the ability to do work close at hand by penning the sheep and sorting them out. It is these elements which have shaped the working abilities of the Border Collie and defined the breed. These dogs are necessarily capable of incredible feats of athleticism, endurance, intense focus, and high levels of trainability. In nearly every region of the world, the Border Collie is now also a breed which is shown in ring or bench shows. For the people who participate in these events, the Border Collie is defined by the breed standard, which is a description of how the dog should look. In New Zealand and Australia, where the breed has been shown throughout most of the twentieth century, the Border Collie standards have produced a dog with the longer double coat (smooth coats are allowed), a soft dark eye, a body slightly longer than tall, a well-defined stop, as well as a gentle and friendly temperament. This style of Border Collie has become popular in winning show kennels around the world, as well as among prestigious judges. However, other enthusiasts oppose the use of Border Collies as show dogs, for fear that breeding for appearance will lead to a decline in the breed's working dog traits. Few handlers of working Border Collies participate in conformation shows, as working dogs are bred to a performance standard rather than appearance standard. Likewise, conformation-bred dogs are seldom seen on the sheepdog trial field, except in Kennel Club-sponsored events. Dogs registered with either working or conformation based registries are seen in other performance events such as agility, obedience, tracking or flyball, however these dogs do not necessarily conform to the breed standard of appearance as closely as the dogs shown in the breed rings as this is not a requirement in performance events, nor do they necessarily participate in herding activities. Its breed standards state that in a show its tail must be slightly curved and must stop at the hock. The fur must be lush. It should show good expression in its eyes, and must be intelligent. It is energetic with most commonly a black and white coat. It should have a very strong herding instinct. In the UK, there are two separate registries for Border Collies. The International Sheep Dog Society encourages breeding for herding ability, whereas the Kennel Club (UK) encourages breeding for a standardised appearance. The ISDS registry is by far the older of the two, and ISDS dogs are eligible for registration as pedigree Border Collies with the Kennel Club (KC) — but not vice versa. The only way for a Border Collie without an ISDS pedigree to be added to the ISDS registry is by proving its worth as a herding dog so that it can be Registered on Merit (ROM). In the United States, the vast majority of Border Collies are registered with the American Border Collie Association, which is dedicated to the preservation of the working dog. Historically, there were two other working-centric registries, The North American Sheep Dog Society (NASDS), and the American International Border Collie Association (AIBC). The breed was also recognised in 1994 by the American Kennel Club (AKC) after occupying the AKC's Miscellaneous Class for over fifty years. The recognition was under protest from the majority of Border Collie affiliated groups, such as the United States Border Collie Club, which felt that emphasis on the breed's working skills would be lost under AKC recognition. AKC registrations have gradually increased since recognition and by the year 2004 there were 1,984 new AKC registrations of Border Collies, with a further 2,378 for the year 2005. By contrast, the American Border Collie Association registers approximately 20,000 Border Collies annually. Because of the inherent tension between the goals of breeding to a working standard and to an appearance standard, the American Border Collie Association voted in 2003 that dogs who attained a conformation championship would be delisted from the ABCA registry, regardless of ability. Cross-registration is allowed between the working registries, and AKC accepts dogs registered with ABCA, AIBC and NASDS; but none of the working registries in the U.S. honor AKC pedigrees. In Australia, Border Collies are registered with an Australian National Kennel Council (ANKC) affiliated state control body or with a working dog registry. Between 2,011 and 2,701 ANKC pedigreed Border Collies have been registered with the ANKC each year since 1986.Inclusion on the ANKC affiliate's main register allows Border Collies to compete in conformation, obedience, agility, tracking, herding and other ANKC-sanctioned events held by an ANKC affiliated club, while inclusion on the limited register prohibits entry in conformation events. The ANKC provides a breed standard, however this applies to conformation events only and has no influence on dogs entering in performance events. Non-ANKC pedigreed dogs may also be eligible for inclusion on an ANKC associate or sporting register and be able to compete in ANKC performance or herding events. Agility organisations such as the Agility Dog Association of Australia (ADAA) have their own registry which allows the inclusion of any dog wishing to compete in their events. In Canada, Agriculture Canada has recognised the Canadian Border Collie Association as the registry under the Animal Pedigree Act for any Border Collie that is designated as "Pure Breed" in Canada. The criteria used is based on herding lineage rather than appearance. It is a two-tiered registry in that dogs imported that are registered with a foreign Kennel Club that does hold conformation shows are given a "B" registration, whereas those that come directly from other working registries are placed on the "A" registry. Recently, the Canadian Kennel Club has polled its members to decide if Border Collies should be included on the CKC "Miscellaneous List". This designation would allow Border Collie owners the ability to compete in all CKC events, but the CKC would not be the registering body. People who compete in performance events support the move. The CBCA is against this designation. The registration of working sheepdogs in South Africa is the responsibility of the South African Sheepdog Association. ISDS registered dogs imported into the country can be transferred onto the SASDA register. Dogs not registered can become eligible for registration by being awarded a certificate of working ability by a registered judge. Occasionally they will facilitate the testing of dogs used for breeding, for Hip dysplasia and Collie eye anomaly, to encourage the breeding of dogs without these genetic flaws. The registration of working Border Collies in Turkey is the province of the Border Collie Dernegi (Turkish Border Collie Association)established in 2007. The president of the association is Dr. Haldun Mergen. The BCD/TBCA is an affiliate of ISDS, and will apply for associate ISDS membership in 2009. The Border Collie breed is also recognised as the prime sheep dog by the International Stock Dog Federation (ISDF), based in Picadilly, London, UK. Border Collies are one of the most popular breeds for dog agility competitions. They also excel at competitive obedience, showmanship, flyball, tracking, and USBCHA Sheepdog trials and herding events. 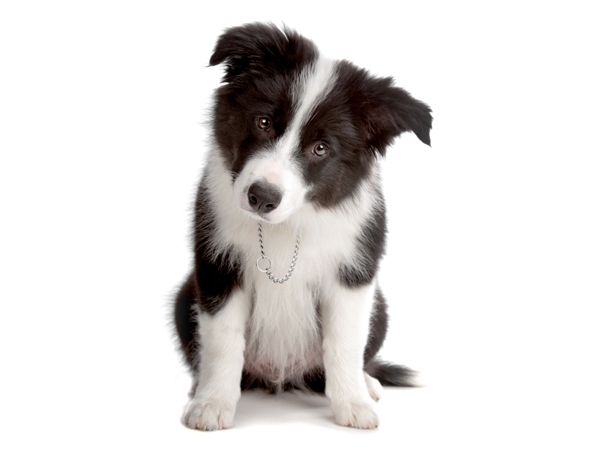 Working Border Collies can take direction by voice and whistle at long distances when herding. Their great energy and herding instinct are still used to herd all kinds of animals, from the traditional sheep and cattle, to free range poultry, pigs, and ostriches. They are also used to remove unwanted wild birds from airport runways, golf courses, and other public and private areas. In the USA, the national sanctioning body for these competitions is the USBCHA. In the UK it is the International Sheep Dog Society, in Canada the Canadian Border Collie Association (CBCA) and in South Africa it is the South African Sheepdog Association. Border Collies excel at several dog sports in addition to their success in sheepdog trials. Because of the high instinct of herding, they are excellent at this sport. Herding instincts and trainability can be tested for when introduced to sheep or at noncompetitive instinct tests. Border Collies exhibiting basic herding instincts can be trained to compete in sheepdog trials and other herding events. They perform well at some higher jump heights at dog agility competitions, so much so that in England, competitions often include classes for ABC dogs, "Anything But Collies". The Border Collie's speed, agility, and stamina have allowed them to dominate in dog activities like flyball and disc dog competitions. Their trainability has also given them a berth in dog dancing competitions.